Our 10 Elegant spacious, comfortable and stylish rooms . Do not leave indifferent and seduce by their discreet charm with a strong mountain character. The ubiquitous and delicately worked wood sublimates the traditional and typical character of the inn bringing warmth and softness. The play of light and subdued lighting highlight beautiful fabrics and meticulously chosen furniture. All the rooms propose the comfort of modern amenities: unlimited free WiFi access, a flat-screen TV (satellite), a bathroom with welcome products and a hairdryer. Next door, it is in this same spirit that we welcome you to the Chalet de Jean, a building of 4 cozy rooms opening on to a secret garden. By taking place in "Marissou", "Toinette", "Clémence" or "Angélique", you penetrate a gentle cocoon that will be difficult to leave! 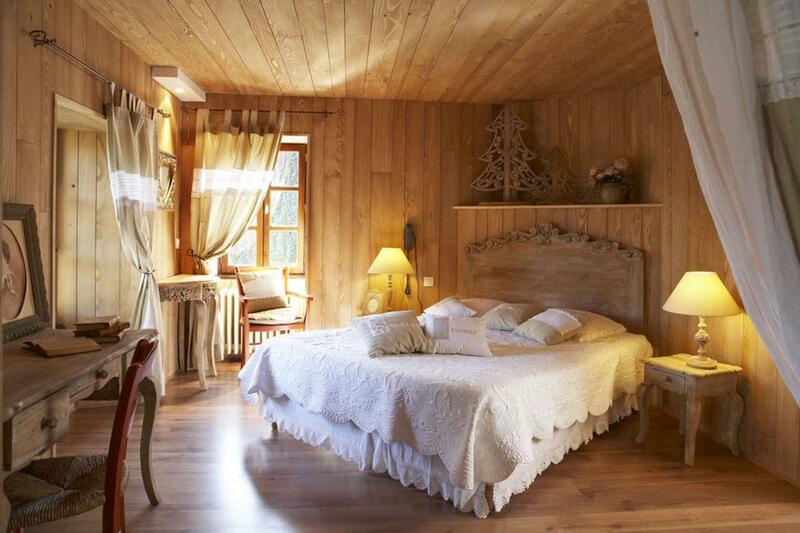 Decorated in harmony with the mountains, these charming rooms combine the warmth of wood and of life. Antique furniture and woodwork tell you a story. Your room will be available from 15:00. You should vacate your room between 10:00 and 11:00. You can enjoy our equipment and our spa until 12 o&apos;clock the day of your departure.